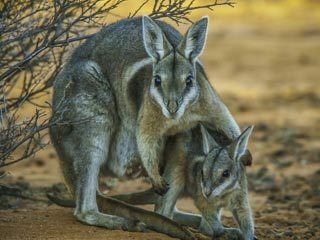 Your donation will help acquire and manage land for the conservation of Australia's threatened species, fund the scientific research that is vital to this conservation work, and support critical conservation partnerships. Friends of the Australia Bush Heritage Fund is a registered 501(c)(3) charity and all donations are tax deductible in the United States. By clicking the above button you agree to have your debit or credit card or bank account charged by Friends of the Australian Bush Heritage Fund. By clicking the above button you agree to submit offline payment to Friends of the Australian Bush Heritage Fund. Call 415-800-3382 or email [email protected]. P.O. Box 2013, Fort Bragg, CA 95437 US.